This stone looks light grey from a distance,with variations in the shade ranging from more white to more grey. Up close, the granite slab is actually white, with the veining and contrast colors varying from very white to an almost grey color. Each slab is different, with distinctive color details and even flecks of black mineral deposits that create beautiful patterns. Bella White granite has a medium level of variation. The main variants within the stone are the grey and white minerals. They can be quite abundant or they can be nearly non-existent. This granite color will look a little different from room to room, depending on the light. In darker rooms, the grey minerals will blend in a little more and the stone will take on a more uniform, darker appearance. In rooms with a lot of natural light, the white will be much more pronounced and the effect will be brighter. Bella White granite can blend beautifully with just about any style, decor, and color combination. From white cabinets to even black cabinets, and every color in between, this neutral granite is the perfect choice! Bella White granite can be used for a kitchen countertop or island, for a floor, bathroom vanity or shower wall, for a basement bar top, and even for an outdoor kitchen- the possibilities are endless! Many homeowners and designers alike find Bella White granite an easy choice for almost any design or remodel project. It’s simple, neutral colors allow for easy decorative changes, without spending too much. The entire look of an area can change by adding different color accent pieces. 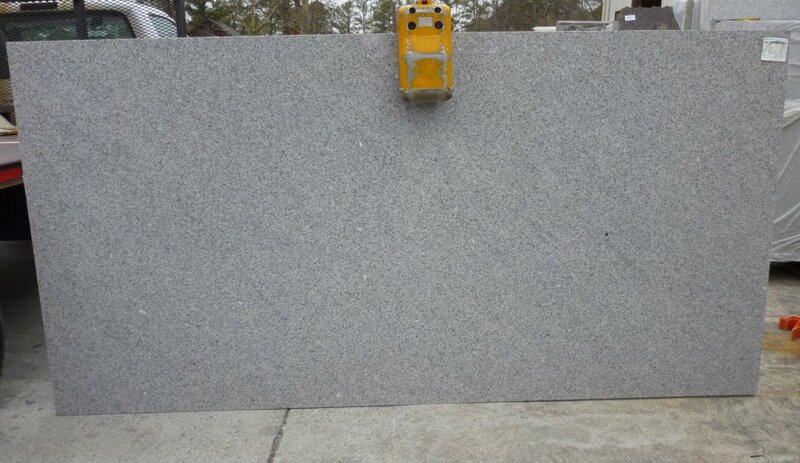 Bella White granite is extremely popular and in high demand. We have recently received new shipments of Bella White, so stop by or give us a call to reserve your granite slab today!